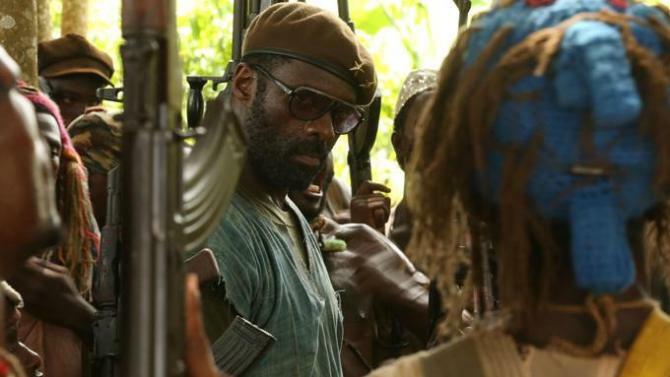 “Beasts of No Nation” is based on the novel by Nigerian author Uzodinma Iweala. Written and directed by Emmy Award winner Cary Fukunaga (“True Detective”) and starring Golden Globe winner Idris Elba (“Mandela: Long Walk to Freedom”), “Beasts of No Nation” is based on the novel by Nigerian author Uzodinma Iweala. It tells the story of Agu, a child soldier torn from his family to fight in the civil war of an African country. Newcomer Abraham Attah gives a stunning portrayal of Agu, while Elba dominates the screen in the role of Commandant, a warlord who takes in Agu and instructs him in the ways of war. Netflix bought worldwide rights earlier this year paying nearly $12 million. Along with Bleecker Street and Landmark they recently announced a partnership that will put the Netflix’s first original film in 19 Landmark markets. The film will debut Friday, October 16 in Landmark theaters in the U.S. and worldwide on Netflix in all territories where the internet TV network is available. Fukunaga’s “Beasts of No Nation” will also be in competition at the Venice Film Festival and will be screening at the Toronto Film Festival in September.